Opus sorabjianum: The Life and Works of Kaikhosru Shapurji Sorabji is the result of more than twenty years of research in collections such as the Sorabji Archive (Hereford), the Kaikhosru Shapurji Sorabji Collection at the William Ready Division of Archives and Research Collections, McMaster University (Hamilton, Ontario), and the British Library. A book of Sorabjian magnitude (xliv, 547 pp. 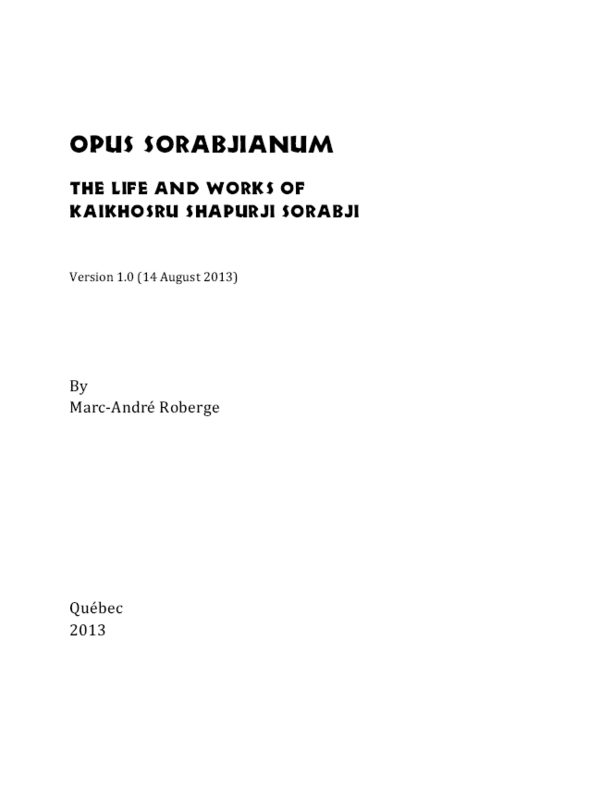 ), Opus sorabjianum, as shown by its table of contents, consists of 23 chapters followed by 4 appendices offering a quick list of works, a full catalogue of works, a complete discography, 100 musical examples, and an extensive bibliography of more than 600 titles. The fully indexed book, which is available for free as a PDF file, can be read on screen or printed and bound. Part 1 (“Family Background and Early Years”) begins with an account of the little we know about Sorabji’s real — and alleged — family origins and his early years, then continues with his friendship with the Heseltine circle and his budding career as a composer at the time of his entry into the Parsi community. It also shows him as a fierce writer entering controversies with fellow musicians through open letters. Part 2 (“A Composer-Pianist at Work”), after documenting Sorabji’s meeting with his idol, the composer and pianist Ferruccio Busoni, broaches such topics as his contacts with music publishers, his interest in occultism and extrasensory perception, and his attitude towards women and children and (what was then called) sexual inversion. Also surveyed are his friendships with the critic Christopher à Becket Williams, the occultist Bernard Bromage, and the composer Erik Chisholm. Further topics are Sorabji’s activities as a music critic and his trips to India to settle matters connected with his father’s death. This part, which also documents the composer’s abilities as a pianist and his attitude towards the piano and the organ, concludes with an account of John Tobin’s unfortunate partial reading of Opus clavicembalisticum, which was instrumental in convincing him of the appropriateness of restricting performances of his works. Part 3 (“The Recluse Composer-Critic”) begins by showing where Sorabji, now retired from public life, stood concerning society, politics, economics, and morals, topics that assume a strong presence in his readings and open letters. It also discusses how he found refuge in his friendships with Frank Holliday and Harold Morland at a time when his dislike of human nature and of England grew considerably. A chapter describes Sorabji’s domestic life with Reginald Norman Best in Corfe Castle, where he had moved in the early 1950s, and his friendship with an American admirer, Norman Gentieu, who paid for the microfilming of his musical manuscripts. Other topics are the last years of the composer’s mother and the problems that her instability concerning residence entailed for him; his unsociable character and attitude to friendship; his relationships with the Scottish poet Hugh MacDiarmid; and his view of religions at the time of the composition of his large-scale symphonic Mass. This part concludes with an account of the growing distaste for composition that led the aging Sorabji, more or less obsessed with health problems, to withdraw from this activity, and with a survey of his attitude towards composers from Johann Sebastian Bach to the practitioners of musique concrète. Part 4 (“Towards Rediscovery”) begins in 1973 at the time of Sorabji’s meeting with Alistair Hinton, who convinced him to resume his compositional activities when unofficial performances of his works were beginning to take place, followed by official ones after he had reconsidered his position, thus paving the way to a rediscovery. The final chapter, before dealing with Sorabji’s death and funeral, surveys various homages paid to him by composers and pianists by means of works written on his themes or modelled on his style and by dedications; it also discusses how various people and bodies have acknowledged his championship of such composers as Godowsky, Szymanowski, and Alkan. An account of a series of practical jokes played by an anonymous correspondent around 1970 brings a lighter note to this rather serious book. Opus sorabjianum also offers an introduction to each of Sorabji’s works in order to clear the land of the brushwood and provide a road map through what may at first look like an Amazonian forest or a hothouse in a botanical garden. Discussed are the peculiarities of the manuscripts, the musical and extra-musical references, the compositional history and the opinions expressed by the composer about them, the dedicatees’ relationships with him, and the most salient characteristics of formal structure and compositional language, in addition to — when applicable — an account of the first performances, when given by Sorabji himself or during his years of public life. Marc-André Roberge is a professor of musicology at the Faculty of Music at Laval University (Québec, Canada). He has published extensively on Busoni, including a 400-page reference book entitled Ferruccio Busoni: A Bio-Bibliography (Greenwood Press, 1991) and on Sorabji, among others the Sorabji Resource Site (inaugurated in 2010) and 27 critical editions of his works. Version 1.0 published online on August 14th 2013.